At a client utility in the Midwest, IMCORP was performing a Factory Grade® assessment on an aged 2615 foot long solid dielectric cable. IMCORP identified the location of the defect and provided Location Matching services to the client to ensure the proper section of cable was removed. 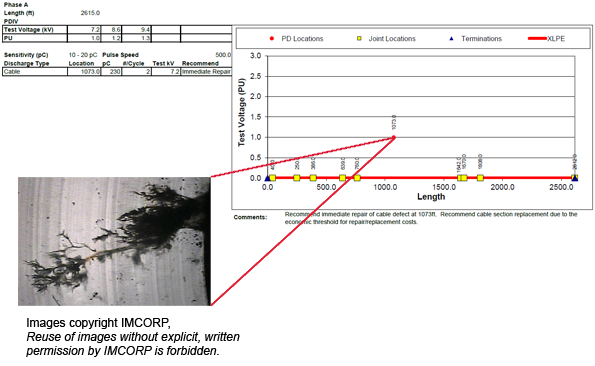 The segment of cable with the defect was sent back to IMCORP’s laboratory for root cause analysis, and the electrical tree (carbon tree/incipent fault channel) shown above was discovered. There is a dual benefit of using IMCORP's servies is demonstrated here. Identification of potential failure points prior to an actual failure helps our clients reduce their unplanned outages and increase their reliability metrics. The second benefit is a better understanding of the failure modes affecting a client’s network reliability. Once a cable fails, it is extremely difficult to provide a post-mortem analysis of the failure mode. The only way to repair and electrical or carbon tree is to remove it from the system.